The recurrence of drought and its immediate impact on other livestock species – cattle, donkeys and mules – has been attributed by nearly all farmers and traders to the increasing shift in the preference of camels. A recently published report, Shifting Sands: The Commercialization of Camels in Mid-altitude Ethiopia and Beyond, describes a relatively new trend in pastoralist livestock marketing that is a dynamic response to increasing demand for camels in mid-altitude areas of Ethiopia and in neighboring Sudan. The report was published by in April 2011 by the Feinstein International Center, Tufts University. 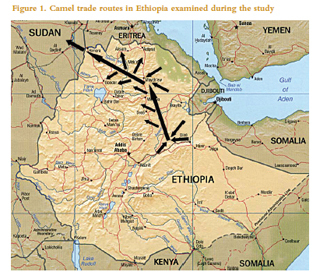 Camel trade routes in Ethiopia examined during the study. 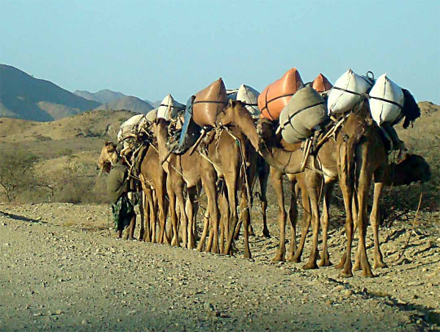 In response to that demand, a camel trade network has evolved that covers about 2000 km, involves more than six ethnic groups, and is served by 24 markets. The rising domestic demand for camels coupled with growing export opportunities to Sudan and Egypt should be viewed as an opportunity for poverty alleviation for those who are involved in raising camels and trade. In this regard, the economic importance of camels need not be measured from the narrow scope of foreign exchange revenue generation alone. Providing appropriate support for the sector has to begin by extending the due recognition farmers deserve for caring and nurturing a species that has been inadvertently ignored by policy makers for so long. The bulk of Ethiopia’s growing formal and informal livestock and meat exports are supplied from pastoralist areas of the country. 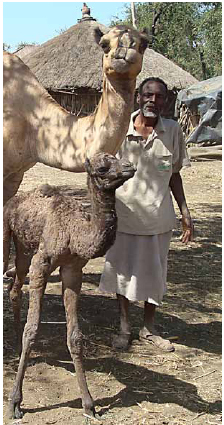 Yimer Ibrahim with one of his newly born camels in the mid-altitude location of Selen Wuha, Alamata. 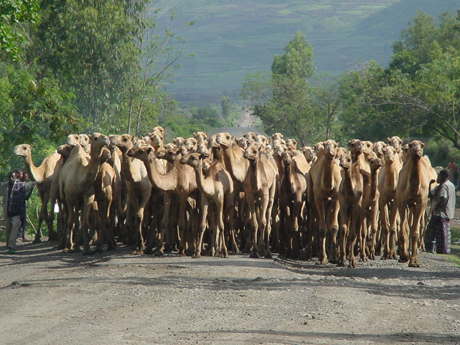 The rising demand for camels by mid-altitude farmers in Ethiopia is associated with the drought-tolerant nature of camels and their multiple uses as pack animals. 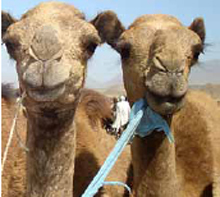 Camels are not only drought-tolerant; they do not require grazing on pasture, which is increasingly lacking. 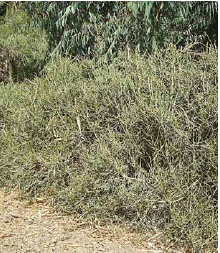 Camels survive and flourish by browsing on available browses and shrubs. The commoonly seen spiny cactus is browsed by camels. 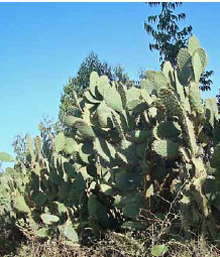 Euphorbia tirucalli is a common food for camels in mid-altitude areas. 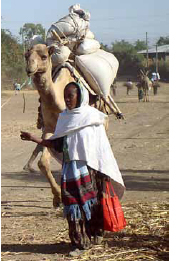 Emerging in the absence of aid or government programs, the camel trade shows how economic synergies between pastoralist and non-pastoralist areas can develop and provides further evidence of the market responsiveness of pastoralists, even when faced by drought and other constraints. 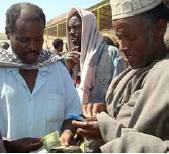 A camel buyer and guarantor at Chifra market, Afar Region. In nearly all the markets each seller is required to produce a guarantor to prove that the camel or camels he is selling actually belongs to him. 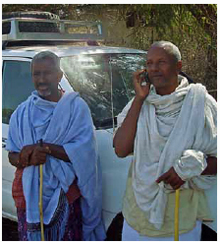 Mobile phones are important for medium-level camel traders. 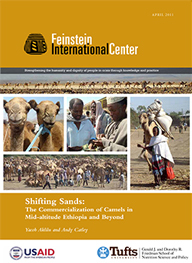 "Shifting Sands: The Commercialization of Camels in Mid-altitude Ethiopia and Beyond," written by Yacob Aklilu and Andy Catley, was published in April 2011 by by the Feinstein International Center, Tufts University. The report is available at http://fic.tufts.edu. Photographs are by Yacob Aklilu. Captions are excerpted from the report.